This list is being developed and expanded to include situations NUFinancials users have encountered since the recent upgrade. Want to get Tips emails? Subscribe to our mailing list. Got a Tip to share? Email it-communications@northwestern.edu. Now click the Approve button again and the transaction will be approved. 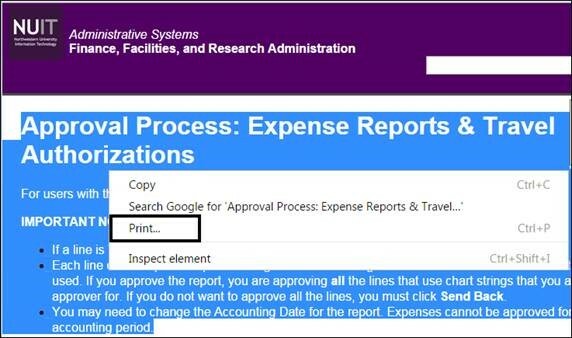 Approvers may change the accounting date in order to approve, send back, or hold Expense Reports after the accounting period has been closed. The process is slightly different than for employees/submitters/proxies. Review and select an approval option. Do you frequently submit similar Expense Reports, either for yourself or for someone else? There's a quick shortcut to save you the need to re-enter all the details. In the Quick Start menu dropdown (where it says "A Blank Report"), select An Existing Report. You'll be taken to the Copy from an Existing Report screen. Here you can find Expense Reports you've entered for yourself or as a proxy for the current employee id, and can use one of these as the basis for a brand new report. Select the report you'd like to copy and proceed as usual, updating any information that has changed. Expenses budget checking runs every 15 minutes, beginning at the top of the hour. This means that approvers cannot apply approval until the regularly scheduled budget check process runs after the Expense Report is submitted. If approvers attempt to approve before budget check has run, they will receive a notification indicating that budget check is required before approval. Solution: wait 15 minutes and then approve. Expense Reimbursements are paid in the same way that you receive your paycheck. If you have direct deposit set up, they are deposited into your Balance account as defined in myHR Self Service. The Balance account is noted as such under "Deposit Type." You may have more than one account designated, but you must have a Balance account. The Balance account can be checking, savings, or a CD account. If you only have one account set up, that is where your expense reimbursement will go. Expense Reimbursements cannot be split among multiple accounts the way a paycheck can. Please note that not all employees have a direct deposit account set up. To enter your Expenses Supervisor when filling out an Expense Report, click the magnifying glass next to the Expenses Supervisor field to select your supervisor. Solution: Return to the header details and select an Expenses Supervisor and resubmit. Remember: Expense report approval emails are also generated for My Wallet expense reports used to reconcile Procurement Card transactions. Although the approval notification email mentions payments and deposits, the reimbursement amount shown at the bottom will be $0. This is similar to expense reports created to reconcile cash advances when no money is due to the employee. Expense Reports returned prior to June 15, 2017 will not appear in the Returned list of Expense Reports. They will still appear in View All. Any expenses that were newly created, resubmitted, or sent back beginning on June 19, 2017 will show as Returned. When entering an Expense Report over 90 days old, missing receipts, etc., you can check a box to indicate that there's an exception. Approvers can also check a box to indicate an exception before approving (no need to send back). Once an exception box has been checked by either an enterer or an approver before submitting, the exception(s) will then be searchable in the Approval Inbox. Note that paper exception forms will still need to be scanned and attached to the Expense Report. I am trying to see expense reports I submitted for another person. 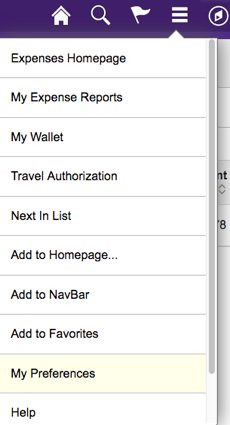 Solution: Click the arrow next to your name to select the other person and you will see their expense reports display. If you try to view Expense Report History, you may see No expense history found. Search parameters can be adjusted in My Preferences. Go to hamburger menu at upper right of screen. Select My Preferences from dropdown list. to display a larger number of months (e.g., 12), and/or status types you would like displayed. Return to Expense History using link at upper left of screen. If you still don't see any Expense Reports in your History, please contact the IT Support Center. The Chart of Accounts represents the accounting structure for how Northwestern gathers, stores, combines, and uses financial information. It is used to trace the flow of revenues, expenses, assets, liabilities, and equity. As long as a budget is NOT needed but a level of granularity for reporting or analysis is needed, you have the option of requesting either of two ChartFields: ChartField1 or Program Code. For help resolving common errors in NUFinancials, please see: Budget, General Ledger, and Combination Edit Errors. If you have difficulty downloading from NUFinancials to Excel, create a local folder as an Excel Trusted Site and download the spreadsheet to that folder. Navigate to Trusted Locations in Excel: File -> Options -> Trust Center -> Trust Center Settings -> Trusted Locations. In addition to bookmarking system login pages in your browser, you can create Favorites in various systems, such as iBuyNU and NUFinancials, to save time...but make sure you keep your Favorites straight! Some punchout vendors in iBuyNU have Favorites functionality specific to their web site. iBuyNU has Favorites specific to the hosted catalogs. Non-catalog items you purchase regularly can also be set up as Favorites in NUFinancials. However, prices don't update dynamically the way they do for iBuyNU and punchout vendor favorites, so you may need to update prices in NUFinancials. Clicking Favorites from the top menu in NUFinancials will show you your Recently Used items as well as options for adding and editing Favorites. NUFinancials users with specific system roles will automatically receive certain types of notifications. Payroll and encumbrances post to NUFinancials and Cognos BI reports after every payroll run (not nightly). are any errors in the file, that schedule is delayed. You may receive an error message indicating that Project ID is invalid. If the Project ID is correct yet still giving an error, confirm that PC Business Unit (also abbreviated as PC Bus Unit) is filled in correctly. The only valid choice for this ChartField is NWUNV. For Expense Reports, PC Business Unit can be located via the Accounting Defaults link. If a requester's personal phone number appears where it should not (e.g, on packing slips), he or she needs to change the "preferred number" in myHR. NUFinancials uses the preferred number. Some online training documents are provided in PDF form and are easy to print. Other items are provided as online, or "HTML" content, which can be more challenging to print. Different browser versions may offer different options than those listed below. The last updated date of a document is located on the bottom of the last page. Keyboard shortcuts work with the browsers listed below. Click in the document window. There is no File menu to print from using Chrome. 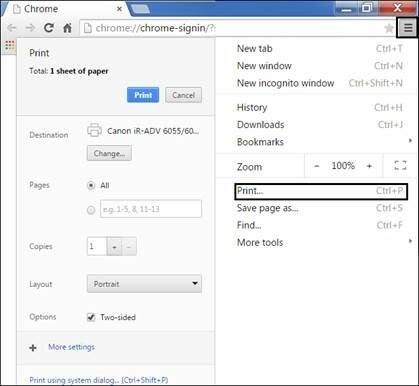 Click Customize and Control Google Chrome and select Print. Alternatively, right click on a page and select Print to print 1 or more pages. Change the Description pulldown to "contains"
You will see a list of Project numbers and descriptions that include the name/keyword(s) you entered. In NUFinancials, type "T" or "today" (upper or lower case) and tab out of the date field for today's date. The percent sign (%) is a wildcard and can be used when searching for information in Cognos BI reports and NUFinancials. The asterisk (*) is a wildcard in InfoEd. View the most updated grants tree in NUFinancials. Click on the "+" to expand the tree. The nodes with the folder icons (such as 60010=Academic Personnel) correspond to budget categories where OSR budgets the sponsored funds. To determine how much money is left on your award or project, use the resources shown in the chart below. The key differences between methods are timing and the F&A encumbrance calculation. Start with the Sponsored Project Budget Statement (GM045). Next, use the Budget Overview in NUFinancials to find today's posts. Calculate F&A on encumbrances and actuals for today's posts. Add results of steps 1-3 to find full real-time balance. When approving a journal, you may notice what appears to be an extra line. These self-balancing lines will appear to double the total. For more information, see the Job Aid: Actuals Journal Approval Tip. Do you need to complete a Correction Journal or a Correction Agency Journal? Do you need to locate the Original Journal ID that NUFinancials requires? It all starts on the GL008 Revenue and Expense Activity Report! Run the GL008 for the chart string that contains the transaction that was incorrectly posted to the General Ledger. If the Transaction Type on the GL008 is Journal, then the GL008 Transaction ID is the Original Journal ID. Look no further! If the Transaction Type on the GL008 is not Journal, you must either drill to detail on the GL008 or use NUFinancials inquiries (either Accounting Entries or Lifecycle Viewer). Affected Transaction Types are expense report, cash advance, and voucher. Budget journals allow users to move spending authority from one chart string to another within the same fund group - current funds unrestricted (funds that begin with 1). Budget journals can also be used to increase or decrease budgets, but such journals must be balanced. Transfer journals move dollars from gifts or endowments to unrestricted or designated chart strings - movement of funds across fund groups. If the funds numbers begin with a different digit, then use a transfer journal. For more about journal types, see: Which Journal Should I Use? To help run frequently used reports quickly, use Run Controls. "Run Controls" (like favorites or a template to be re-used) for NUFinancials reports are attached to individual IDs, so users can establish them for exact types of reports that they will run over and over. For the Budget Status Report, for example, a user can create more than one run control for that report. So, if so sometimes you need to have a report that rolls everything up to the Fund-Dept, you can create and save a run control for that report. If you also need to report on Dept-Project, you can create and save an additional run control for those parameters. This will help you run the NUFinancials reports that you need very quickly – you don't have to establish the parameters every time you want to run them. Users cannot delete run controls. When creating a multi-line, non-catalog requisition for the same vendor, use the Line Defaults to ensure that the same vendor and location is entered on each line automatically. When you enter your vendor in the Line Defaults section, the Vendor Location auto-populates for each line based on your Vendor selection. Using Line Defaults avoids a common issue with requisitions being sourced into multiple Purchase Orders based on different vendor locations. The issue occurs because many vendors have multiple locations. If you copy-and-paste or enter location manually to each line, the system will only use the first location it has listed behind the scenes, which may not be the one you selected. The NULL error is an unrecoverable error and you will want to cancel/abandon the REQ that you were creating. Ensure that you are only working in one window/tab of NUFinancials, and that you are not also working in myHR or CAESAR. Do not use the browser's back arrow when navigating through NUFinancials. Clear your browser's cookies and cache, exit entirely out of the browser, and then log back into NUFinancials. The item category "LAB_HAZARDOUS_GAS" automatically defaults in the Account Code 73370 (Hazardous Gas). This account code will automatically route a requisition to the Office for Research Safety (ORS) and, for grant accounts, to ASRSP. See table below for all account codes that route to ORS. Invoices for regularly scheduled University purchases (e.g., waste removal from labs, etc.) are created using a blanket non-catalog requisition in NUFinancials. Requisitions and Purchase Orders (REQs/POs) need invoices for the matching and payment process, but invoices SHOULD NOT be attached to REQs/POs because Accounts Payable (AP) can't see attachments to REQs/POs. Requesters should enter a receipt on all requisitions except for the following. Requesters can enter receipts on behalf of other Requesters if necessary. All catalog requisitions (items from iBuyNU). Until the underlying issue is resolved, the following workaround will prevent Ship to codes from disappearing from requisitions. On the Edit Requisition Save and Submit page, click Requisition Settings. The following message displays: "Retrofit field changes to all existing requisition lines/schedules not already sourced to POs. (10150,296)." Click OK. If the Budget Header Status is "Valid" click Save and Submit. If the Budget Header Status is "Not Checked" click Check Budget then Save and Submit. A credit may be issued by a vendor for several reasons: return of an item, wrong item sent, damaged item, etc. Credits from vendors in iBuyNU are handled differently from credits for non-catalog requisitions. In an effort to eliminate the risk of duplicate Purchase Order (PO) processing, POs will not be refaxed unless it’s been 48 hours since the original fax was dispatched. Refax requests must be submitted via email to procurement@northwestern.edu. All written requests must include the PO#, Vendor Name, and supplier fax number. Please send all refund checks received from vendors to Accounts Payable at 2020 Ridge to be deposited. Please include the original PO number and/or Voucher number and chart string (including the account used on the original PO or Voucher) on documentation sent with the check so that the refund amount can be credited correctly. This is important because refunds should be used to reduce the amount of expense on the chart string used. If refund checks are deposited as revenue, it gives a false picture of the actual revenue earned by the chart string.